Determining whether in-place concrete strength is sufficient for early application of loads, such as due to formwork removal, application of prestressing. Determining whether the in-place strength is sufficient for terminating curing and thermal protection. Evaluating the quality of the critical cover layer protecting the reinforcement in the finished structure. A steel disc, 25 mm in diameter at a depth of 25 mm, is pulled centrally against a 55 mm diameter counter pressure ring bearing on the surface. The force F required to pullout the insert is measured. The concrete in the strut between the disc and the counter pressure ring is subjected to a compressive load. Therefore the pullout force F is related directly to the compressive strength. 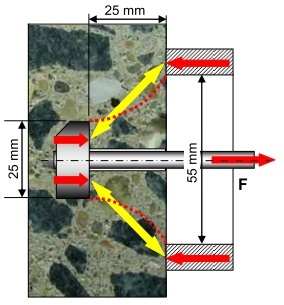 Loading is performed either to a required force, in which case the test is nondestructive, or to the peak-load, which results in a slightly raised, 55-mm diameter circular crack on the surface. The disc is cast into concrete either by attaching it to formwork before placing concrete or by inserting it manually into the fresh concrete. 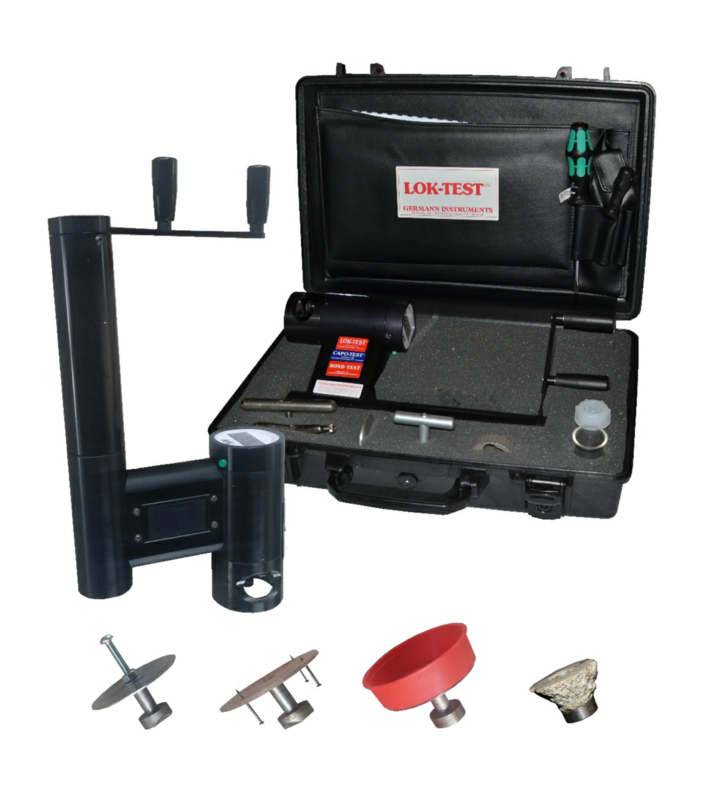 Various LOK-TEST inserts are available. 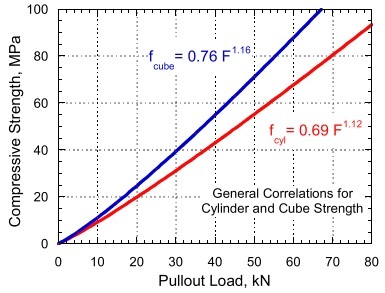 LOK-TEST provides an accurate estimate of in-place strength because the peak pullout force has a well-defined correlation to compressive strength measured using standard cylinders or cubes. More than 30 years of correlation experience from all over the world indicates close agreement, suggesting that one general correlation is applicable for all normal density concrete mixtures, as shown below. A different correlation, however, has been found for concrete made with lightweight (low density) aggregate. The general correlations shown in the following figure will provide sufficient accuracy for all normal density concrete mixtures. Project specifications, however, may require development of mixture specific correlations. In this case, ACI 228.1R can be used to develop such relationships. 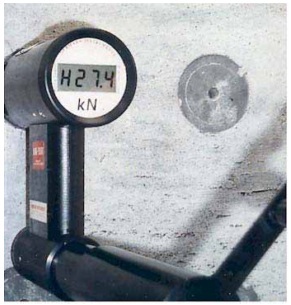 At the 95 % confidence level and for an average of 4 tests, the estimated compressive strength based on the LOK-TEST and the general correlations indicated above is within ± 6 % of the strength measured from tests of standard specimen (cylinders or cubes) for a maximum aggregate size of 38 mm. 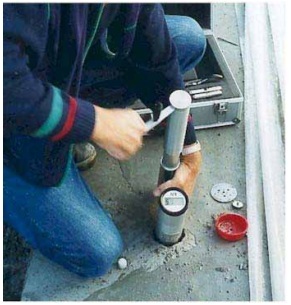 The coefficient of variation of individual LOK-TEST results is about 8 % for normal density concrete. 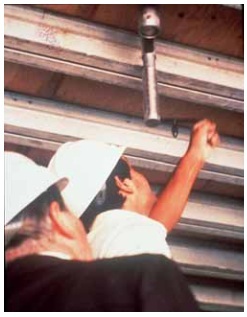 LOK-TEST being performed on a wall for quality control of the finished structure. “H” on the display indicates the highest pullout force obtained. The L-40 Control Insert was used. LOK-TEST performed from the bottom of a slab, through the formwork, for safe and early form removal. The L-42 early stripping insert was used with the L-44 steel plate attached to a removable plug through a porthole in the formwork. The L-10-2 pull machine (no longer available) with analog display is shown. 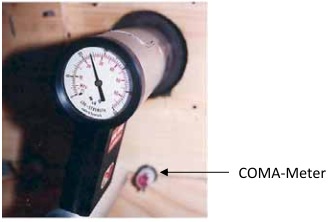 COMA-Meters are used for timing of the LOK-TEST. LOK-TEST inserts are supplied in four different configurations (shown left to right below) and in two strength classes: (normal strength) 0 to 50 kN and (high strength) 0 to 100 kN pullout force. Control inserts for nailing to wooden formwork. The formwork has to be removed before testing. Early stripping inserts, with a steel plate for attachment to a removable plug through a porthole in the formwork, for use if testing has to be performed before the formwork is removed. Inserts may be re-used provided the discs are thread locked to the stems and coated with a coating agent, L-29, before re-use. For complete pulling out of discs from the concrete, a separate travel ring, L-26, is available. 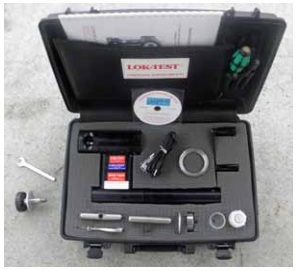 For testing 0 to 100 kN inserts, a special high-strength pull bolt with flange is needed, L-17-1, along with the high-strength coupling device C-141. The L-11-1 hydraulic pull machine comes with a 0 to 100 kN precision electronic gauge that includes memory for storage of test results (peak-value, time, and date of testing). The peak-value is displayed after a test has been terminated. 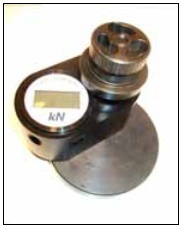 The internal resolution of the gauge is 0.01 kN. The display, however, shows the pull force to the nearest 0.1 kN. 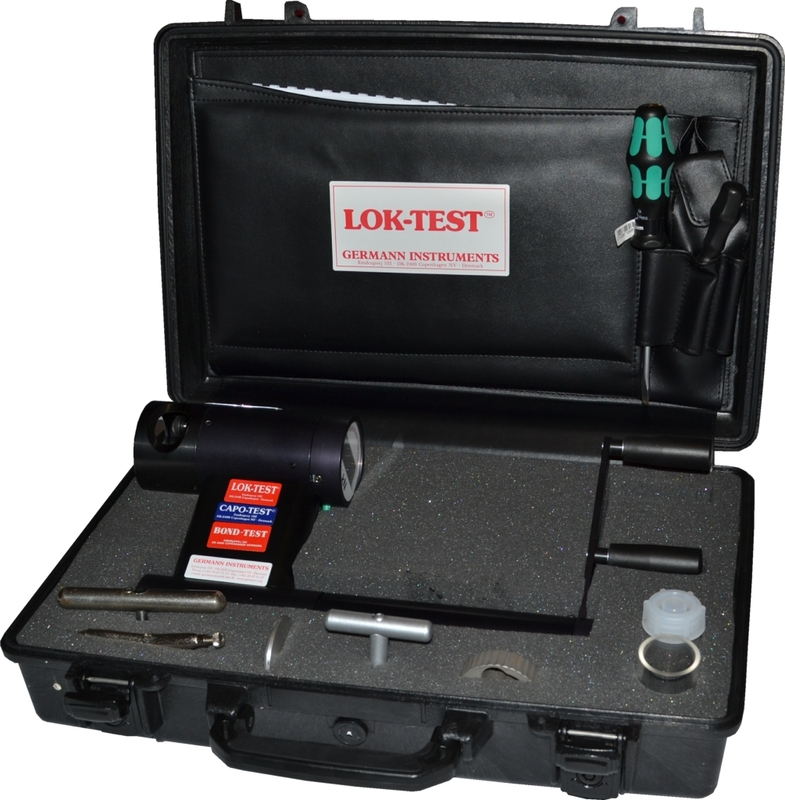 Note: The LOK-TEST pull machine may also be used for other types of tests that require application of a tensile load. 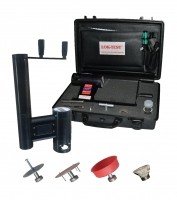 These include the following Germann Instruments test systems: the CAPO-TEST, the BOND-TEST , the TORQ-TEST, the DSS-TEST and the POWER. 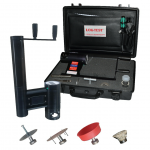 The recommended pull machine for all the tests is the L-11-1 hydraulic pull machine supplied in the L-11 LOK-TEST Kit. The calibration of a pull machine needs to be verified at least once a year, after servicing, and after repair. 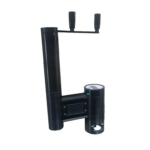 The L-30 Load Verification Unit has a working range of 0 to 100 kN. The load is displayed to the nearest 0.1 kN. 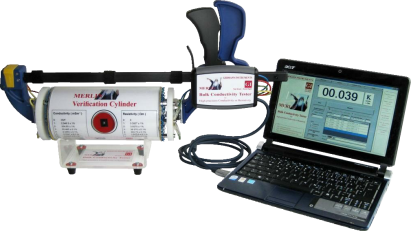 The unit comes with a certificate verifying the accuracy of its calibration. 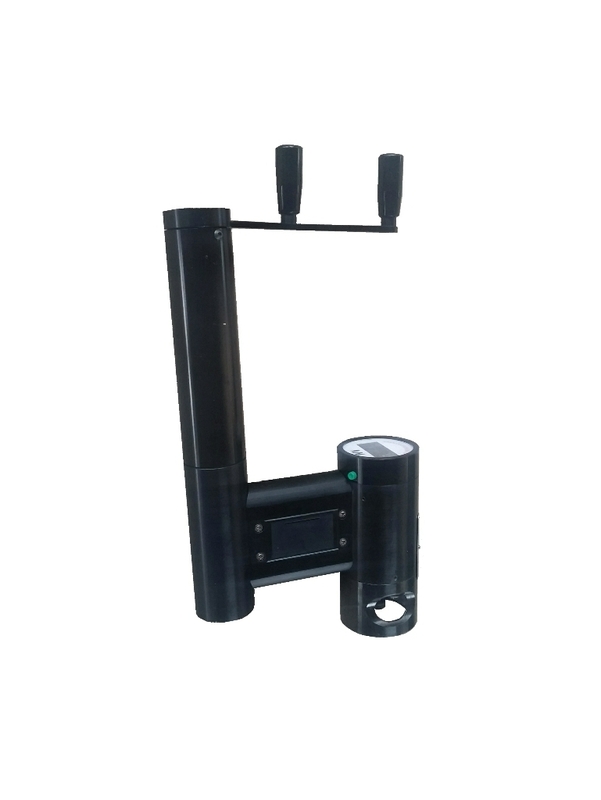 The L-30 unit ensures that the load displayed by the pull machine is within 2 % of the actual load, as required by ASTM C900.